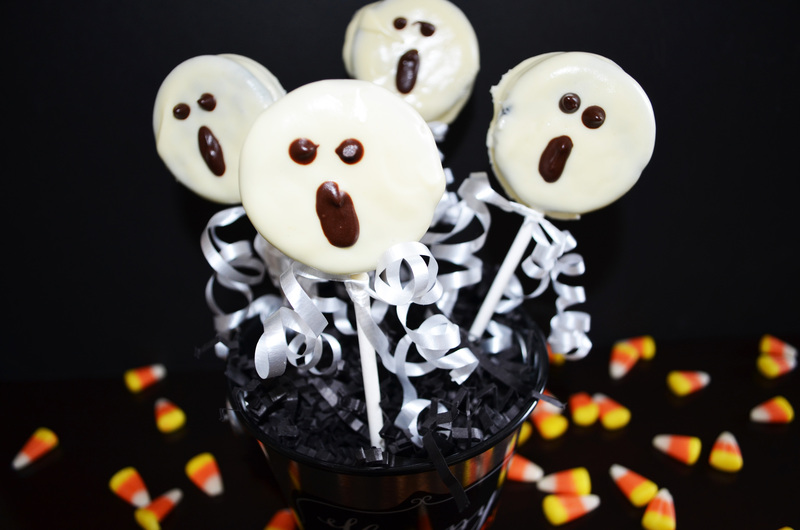 The cutest little ghost cookie pops around! Seriously, my toddler and I had too much fun assembling these and chasing each other around saying “Boo!” with our little ghost. I’m all about making simple and fun kids foods that are not overly complicated, these adorable ghost are just that. The cookie pops did not last long, but the memories of making them, eating and playing with our ghosts will last forever. I took one of Maxwell’s favorite cookies, Joe Joe’s chocolate cookie cream sandwiches from Trader Joe’s and made them into these scary Halloween ghost cookie pops. The chocolate cookie with chocolate filling was delicious; smothered in the white chocolate coating. By taking melted milk chocolate chips I added two tiny circles for the eyes and one oval for the ghost mouth. The bottom of your little ghost is curled white ribbon and to display I stuck them in styrofoam purchased from a local craft store.